More and more people are blending western medicine with natural remedies in order to keep from taking so many pills. Maybe you saw your grandparents carrying around a pill case so as not to miss one of their 20 pills a day for varying conditions and symptoms. If you are trying to avoid such a fate by seeking natural relief for vertigo, we’re here to help. First, we will look at some things you can do at home to reduce the frequency of vertigo with self-care. Then we will address a natural therapy that has helped hundreds of patients in case studies to break free from vertigo. If you get vertigo on a recurring basis, you may notice that certain things trigger an episode. One of the most common vertigo triggers is stress. This makes having a positive way to cope with stress an important form of self-care. We use the qualifier “positive” because many people do things like smoke and drink to deal with stress. Unfortunately, both of these habits can make vertigo worse. Drinking too much can dehydrate you (we will discuss the importance of hydration in a moment), and smoking restricts blood flow in the body, which can affect the various system that controls balance and spatial orientation. What are some positive stress coping mechanisms you can try? Talk to someone – Getting your feelings out, whether it be with a trusted friend or a professional therapist, can be a good way to deal with stress. Take up a new hobby – Find something relaxing to do with your downtime such as taking up an art form, learning an instrument, or even reading novels in a hot bath. Take a vacation – You have to know when to get away from it all. If work doesn’t let you leave for a week, schedule an occasional weekend away, or even a relaxing day trip. Go to the spa – Getting a massage and taking a day to pamper yourself is a good way to let off some steam. Plus, some of the treatments may be good for your health. The quickest way to get rid of vertigo may be to drink some more water. Vertigo is one of the earliest symptoms of dehydration, so it’s time to take a look at your habits and see if you are getting enough fluids. Remember that drinking a pot of coffee doesn’t count. Coffee and tea are diuretics, so they can actually end up dehydrating you more. Sugary drinks and beverages filled with artificial sweeteners are also bad for hydration. You may want to try an app that allows you to record when you drink a glass of water. See if you can keep up with drinking eight 8-ounce glasses of water per day for an entire week. Do you find that your vertigo is worst in the morning, or maybe you even wake up with the room spinning? The problem may be the way that you are sleeping or even the pillow that you are using. The neck plays a key role in the body because it facilitates blood flow to the brain and the cervical vertebrae are in close proximity to things like the brainstem and the ears. As a result, you need to take care of your neck while you sleep. Sleeping on your back or on your side are the best options. Sleeping on your stomach results in having to keep your neck twisted all night so you can breathe. Remember to get a pillow that allows your neck to maintain its natural curvature. For back sleepers, this means using a slimmer or softer pillow. For side sleepers, you want your pillow to have a little more thickness to it or to be of a medium firmness. While all of the self-care measures you take at home can make a difference, if your vertigo is stemming from a misalignment of the atlas (top bone in the neck), then you will need to get the underlying problem taken care of in order to get complete relief. In a number of case studies, upper cervical chiropractic has helped patients who were dealing with this specific type of misalignment. For example, in one study, 48 out of 60 patients were completely vertigo-free after upper cervical chiropractic. The other 12 patients in the study all saw significant benefits. In a larger study involving 300 patients with Meniere’s disease (a condition that causes severe vertigo), 97% of the patients benefited from having an atlas misalignment corrected (with an average of a 90% reduction in vertigo over the course of treatment). If this sounds like a drug-free option that you are willing to try in order to break free from vertigo, we encourage you to find a practitioner of this chiropractic subspecialty in your local area. Upper cervical chiropractic is known for its focus on the atlas and for low force corrections that do not involve any popping or twisting of the spine. To learn more, schedule a no-obligation consultation today. 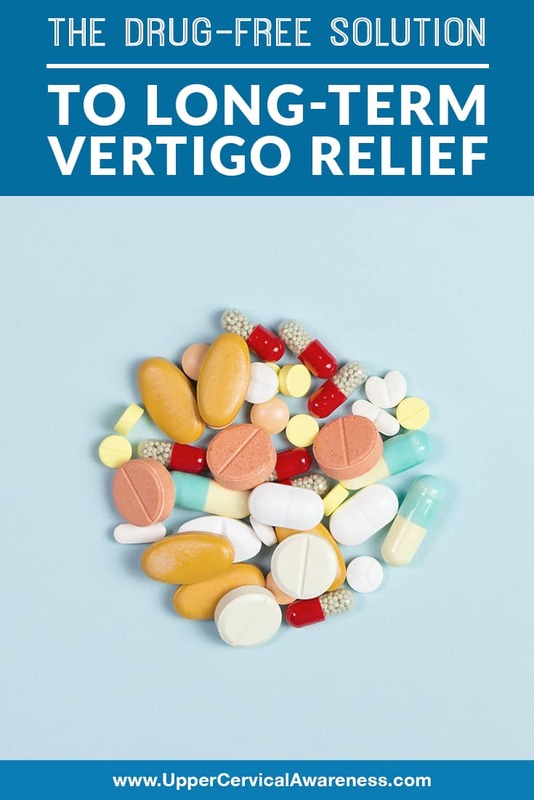 If an atlas misalignment is at the root of your vertigo problem, you may have just discovered a long-term and natural solution for finding relief.